You know the feeling; and you have experienced the awful walk of shame. You can still hear the sound—the sound of the last lightweight air hockey puck rattling into your cave-like goal, signaling yet another air hockey game defeat. Maybe it was a buddy that took you down; or maybe your excited child finally overtook you at your own game. At worst, it might have been your girlfriend or wife who dealt you that final soul-crushing blow, and now you will have to endure her taunts and boasts until the next game comes around. Until then, however, she will no doubt make it very clear as to who is the “real winner” in this relationship. If this is the case, we truly feel your pain! 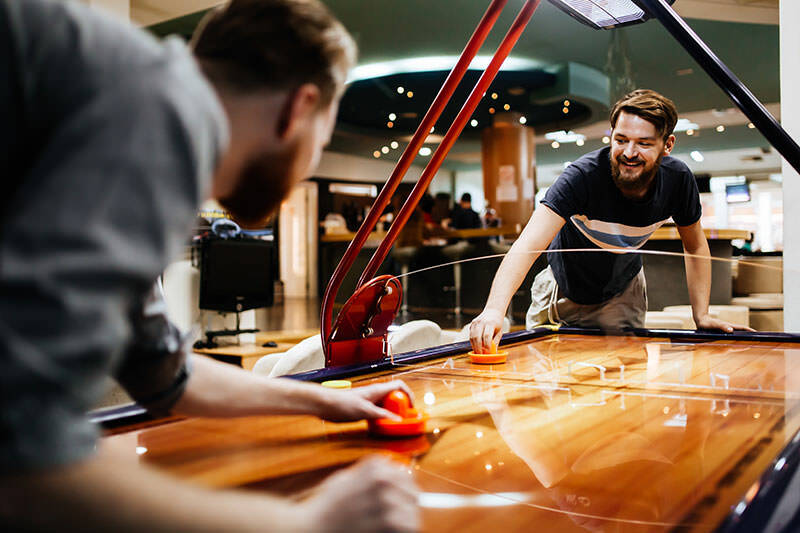 Air hockey is one of the most joyous and jubilant arcade games ever invented. It can also be quite competitive. Hence, when you consistently lose match after match it can be quite defeating—even humiliating. Fortunately, there are some sure-fire tactics that might help turn that frown upside down and we have the answers. In the following article we have highlighted and explained, in detail, several strategies for consistently winning at air hockey—a tutorial that can rapidly transform even the worst air hockey players into consistent champions. Before we commence with the winning air hockey tips, let us first call a brief time out so we can talk a little bit about the proper way in which to hold the paddle or mallet in air hockey. As you know, the air hockey paddle is a rounded disk with a raised handle that is rounded off on top. Because of this shape, most novice players tend to immediately grab this rounded portion with their palm of their hand, or grab it with their palm to the side. Sure, this might feel comfortable, but this grip strategy does not lend itself to speed and accuracy. So, let’s look at how to hold the air hockey mallet for the optimal offensive and defensive strategy when you play. If you watch professional air hockey players (yes, there is such a thing), you will notice they grip the paddle by bending their middle finger and placing it behind the back of the paddle. They then place their forefinger and ring finger on either side of the paddle, leaving their thumb and pinky finger off the paddle entirely. This grip is designed to control the action of the puck, but if you’re following along in your head you might be thinking that this sounds a bit uncomfortable. Well, it is. Instead, we recommend you hold the paddle with all four fingers, placed in the rim of the paddle to the back and side. By not holding the paddle with your palm you allow for greater wrist action, increased control and much faster shots. Truth be told, the best offensive strategy in air hockey is a good defense. Like in all competitive sports, if you can prevent the other side from scoring it becomes increasingly difficult, even impossible, for you to lose the game. Despite the absolute importance of a well-thought-out and strong defense when it comes to winning at air hockey, you will still need to put the puck in your opponent’s goal to win, at least as many as 7-15 times depending on the variation you are playing. When it comes to offensive strategy, there are a few primary shots of which you should be totally skilled. The two most important of these is the straight shot and the bank shot. Once you have completely mastered these two basic shots you will already be way ahead of the game. Moreover, by becoming proficient at the straight shot and bank shot, you can then add other offensive moves to your arsenal, including jukes, fakes, misdirection shots and drift shots—a strategy in which you lull your opponent to sleep by lightly tapping the puck away from your own goal zone, and follow that soft shot up with a slam shot that will catch your opponent off guard. The straight shot might seem like the simplest and most straightforward type of shot—and in some ways it is—but a perfectly timed straight shot is a wonderful tool that can help you take advantage of an opponent who is out of position. In many ways the straight shot is a tricky shot, given that most air hockey pucks tend to move in an angled fashion due to the rectangular-shape of the table. As such, the straight shot can be a difficult one to master. However, once you practice and become proficient with the straight shot, you can start showing up even the better players who tend to over-commit to a big shot. Bank shots are much more common in air hockey than straight shots. These types of shots also come in many different varieties. However, regardless of the type of bank shot you hit, the goal should always be to strike the back portion of the puck rather than the side of the puck. When a puck is struck from the side, it becomes far more likely that you will hit a double or triple bank shot. These types of bank shots tend to slow up when they reach the goal, and are thus easier to block. Shots hit behind the puck, however, tend to go faster and will bank only once before entering the goal. There are two very effective types of bank shots: the “over” and the “under.” These do not require any specific knowledge of math or geometry. In fact, they are quite simple to understand. When hitting the over shot, you will want to start the bank by hitting the back of the puck against one of the side rails on your side of the table. In doing so, you will create a bank shot that goes “over” your opponent’s paddle when he or she is closely guarding the goal. On the flip side, when shooting the under shot, you will start your bank shot by smashing the puck against one of the rails on your opponent’s side of the table, creating a sharp-angled shot that will go “under” your opponent’s paddle when he or she is guarding too far away from the goal. In short, when the goal is being closely guarded, choose the over bank shot, and when your opponent has his or her paddle away from the goal, choose the under bank shot. As we mentioned above, a good air hockey offensive strategy is to play great defense. To help you accomplish that, below we have outlined just a couple defensive strategies that can help keep your opponent’s puck out of your goal. When mastering defensive air hockey strategies, the first thing you will need to learn is where to hold the paddle in relation to the goal. Most novice players tend to hold the paddle either right up against the goal or about one to two inches in front of the goal. This placement strategy will certainly help you block some shots, but it gives you very little time to appropriately react to blocks and creates a situation in which your goal is prone to ricochets from the paddle. Instead of holding the paddle very near to the goal, try to hold it about 6 inches to 12 inches away from the goal depending on the size of your air hockey table. In doing so, you can narrow down the angle when defending against the less common straight shots, while still allowing you to react to bank shots by quickly moving the paddle or mallet backwards. Once you are in the proper defensive position, the key is to track the puck. Players who attempt to “chase” the puck with their paddle while on defense tend to be very easy prey because their reaction time cannot match the speed of the puck. Instead of chasing the puck, you should instead try to track the puck’s movement with your eyes. In doing so, you can then move to cut off the path of the puck where it will enter your goal. This will give you much more time to react and thus more time to plan a counter-attack with either a well-timed straight shot or one of the two bank shot varieties mentioned above. Once you have completely mastered these easy to learn offensive and defensive air hockey strategies, you can definitely increase your chances of winning. To further stack the odds in your favor, try to study your opponent and learn and adapt to his or her style of play. For example, after a few games, it should be fairly easy to determine if your opponent favors, say, the straight shot over the bank shot. Once you see this, make a mental note of it and set yourself up both defensively and offensively to counter his game. If you so this, chances are pretty good that your side of the scoreboard will begin to light up more consistently.